The Imagining the Internet Center's mission is to explore and provide insights into emerging network innovations, global development, dynamics, diffusion and governance. Its research holds a mirror to humanity's use of communications technologies, informs policy development, exposes potential futures and provides a historic record. It works to illuminate issues in order to serve the greater good, making its work public, free and open. The center is a network of faculty, students, staff, alumni, advisers and friends working to identify, explore and engage with the challenges and opportunities of evolving communications forms and issues. They investigate the tangible and potential pros and cons of new-media channels through active research. Among the spectrum of issues addressed are power, politics, privacy, property, augmented and virtual reality, control and the rapid changes spurred by accelerating technology. The Imagining the Internet Center sponsors work that brings people together to share their visions for the future of communications and the future of the world. The contact for connection is center director Janna Quitney Anderson (andersj [at] elon [dot] edu). The Elon University site Imagining the Internet: A History and Forecast is a multi-section resource containing thousands of pages. It exposes future possibilities while simultaneously providing a peek back at the past. In it, you will find the words of thousands of people from every corner of the world, from today and from yesterday, making thousands of predictive pronouncements about the future of humankind. This resource includes special explanatory sections on the future and past development of communications networks (Forward 150/Back 150). It includes videos recorded at global conferences that reveal future hopes and challenges as expressed by hundreds of Internet leaders, including Vint Cerf, Douglas Engelbart and Robert Kahn (Visionaries Multimedia). It has informative areas targeted to benefit children under 12 (KidZone), and to help teachers of elementary, middle school, high school and college students use the site to educate (Teachers' Tips) . It allows you to enjoy thousands of world citizens' discussions of our future – from top experts (Predictions Surveys) your neighbor down the block or a farmer in Nigeria (Voices of the People). It allows you to add your vision to the collection by opening up a "Share Your Prediction" form and telling us what you think. Just look for the phrase Share Your Prediction - found in the top-right corner of every page, near the website's logo. The site shares a look back at what people were saying in the 1990s during the "awe" stage of the development of the internet (Early '90s Predictions Database). And it records a legacy of predictive statements as they are made, continuously building a historic record of lasting value that documents the way we see ourselves as we move into an explosion of changes wrought by the combination of genetics, nanotechnology and robotics as they leverage our future networks. The research initiative was inspired by a suggestion from Lee Rainie, director of the Pew Research Center's Internet & American Life Project, during a visit to Elon University in 2000. He spoke then with faculty members Janna Anderson and Connie Ledoux Book about his idea to assemble a database of predictions - this idea was inspired by Ithiel de Sola Pool's research work "Forecasting the Telephone." Imagining the Internet has grown from there to include much more, including journalistic documentation of major policy events and conferences and the foremost collection of video documenting people's hopes and fears for the future of the Internet. While Elon University does not engage in sponsored research, the Imagining the Internet Center is not fully funded, and Elon - a non-profit, private university - is seeking donors willing to support its continuing global-good projects. Following is a year-by-year breakdown of Imagining the Internet's development. 2000-2001: Survey planning and recruiting was undertaken for the Pew- and Elon-funded project One Neighborhood, One Week on the Internet. The daily Internet use of 24 families in a small-town neighborhood in Elon, NC, was documented by a team of student researchers led by Janna Anderson over the span of one week in January 2001. The work was also documented in a full page of news stories in USA Today: 24,000 Minutes on the Internet. 2001-2002: Connie Book undertook a small preliminary study funded by the Pew Internet Project, seeking "future of the Internet" predictions made between 1993 and 1995 in the Lexis-Nexis database. Book's ensuing 2002 research report, an analysis of several hundred predictive statements, established the following major themes: The Internet will transform society; it will transform economies; content will drive the Internet's success; the Internet presents security and privacy concerns; the Internet's growth is dependent on an efficient and reliable infrastructure; the Internet will spawn a new generation of hardware and software; it will create a smaller world; it will transform America's schools; it will impact professions. The interesting results found in this work made it evident that the predictions research should be expanded upon. 2004-continuing: Upon the completion of the Early 1990s Predictions Database, further development of the Imagining the Internet site continued under Anderson's direction. Rainie was inspired by a suggestion from futurist Bruce Sterling to fund the first of what became a series of Web-based surveys in which experts shared their views on the potential future of the Internet. In 2004 and years to follow, experts quoted in the early 1990s database and many other technology stakeholders and skeptics have been sent an e-mail invitation to participate in the "Future of the Internet" surveys. The responses are published along with an accompanying research report in the Predictions Survey section on this site. In addition, the Voices of the People section of the site, started in the fall of 2004, is a constantly evolving, open invitation to everyone in the public to share their thoughts about the future of networked communications. It includes more than a thousand predictions from every corner of the earth, and it is one of the most fascinating facets of Imagining the Internet. 2005-06: Janna Anderson's book based on the initial collection of Early '90s predictions, "Imagining the Internet: Personalities, Predictions, Perspectives," was published by Rowman & Littlefield. The Imagining the Internet site was redesigned to add extra layers of information, expanding beyond the initial projects underwritten with partial support from Pew Internet. 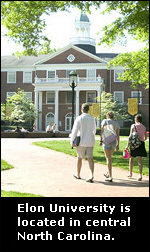 In 2005-06, Elon University funded the addition of documentary video and audio recordings sharing the ideas of visionaries (Visionaries Multimedia). Anderson and Elon students and staff recorded interviews with participants at the Accelerating Change Conference in 2005 and the Metaverse Roadmap Summit and the first-ever Internet Governance Forum in Athens in 2006. Additional sections were added to the site in 2006 to: educate children under age 12 (KidZone); help teachers of elementary, middle and high school students use the site (Teachers' Tips); and provide perspective in narrative form about the past and the future (Forward 150 and Back 150). 2006-07: Anderson and Rainie published their second "Future of the Internet" survey. Day-by-day video and written coverage of the second Internet Governance Forum in Rio de Janeiro in 2007, was captured by a documentary team of Elon faculty, staff and students. Elon student Erin Barnett edited together a compilation of interviews from IGF-Athens to complete the documentary film "Bridging the Digital Divide." The film was selected for presentation at IGF-Rio, the National Conferences on Undergraduate Research and the Broadcast Education Association conference. 2007-08: Elon University formally established the nonprofit Imagining the Internet Center, based in the School of Communications. An Imagining the Internet team edited and posted four hours of video interviews with 31 stakeholders recorded at the 2008 Future of the Internet Economy conference of the OECD in Seoul, Korea. A book-length version of Anderson and Rainies' first predictions survey was published by Cambria Press, "Up for Grabs: Future of the Internet I." In addition, the results of the 2007 IGF-Rio Internet Policy survey "Realizing the Global Promise of the Internet: The Future of Internet Governance," funded by Pew Internet, were assessed and a report by Book and Anderson was posted on the site. The results of the third "Future of the Internet" survey conducted by Anderson and Rainie were published on the site in December 2008. 2009-10: Cambria's book-length version of Anderson and Rainies' second expert-predictions survey, "Hopes and Fears: Future of the Internet II," was released in January 2009, and the book version of their "Future of the Internet III" survey was published in July 2009. More than 100 video clips featuring the web coverage of the third UN-facilitated Internet Governance Forum in Hyderabad, India, were posted on the site, along with PDFs of the IGF 2008 transcripts. Anderson was chosen to the steering committee of IGF-USA and students and faculty representing Imagining the Internet participated in the planning of the first two regional Internet Governance Forum-USA conferences and carried out full documentary coverage, with written and video accounts added to this site. Elon students Randy Gyllenhaal, Alex Trice, Kirsten Bennett and Morgan Little participated in panels at the events. A documentary team collected hundreds of video clips while completing a survey and providing written journalistic coverage of the fourth Global Internet Governance Forum-2009 in Sharm El Sheikh, Egypt, in November of 2009; Anderson participated in the panel on Transnationalization of the Internet and student Eugene Daniel participated in the Youth Panel at IGF-Egypt. Imagining the Internet planned and carried out FutureWeb, a multi-day, multi-event conference held in conjunction with the Global WWW2010 conference in Raleigh, NC, USA, April 28-30 and added documentation of FutureWeb events to this sitel; among the speakers were Vint Cerf, Tim Berners-Lee, danah boyd, Danny Weitzner, Carl Malamud and Doc Searls. 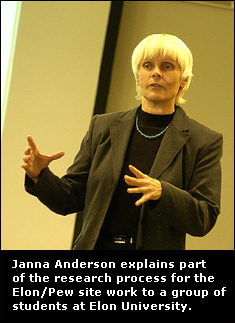 The results of the fourth "Future of the Internet" survey conducted by Anderson and Rainie were revealed in six reports between February and July 2010, including presentations at the annual meeting of the American Association for the Advancement of Science and at the World Futures Conference. A documentary journalism team led by Elon associate professor Glenn Scott and including student reporters Bennett, Drew Smith and Samantha Baranowski conducted dozens of interviews and participated in panels at the Global Internet Governance Forum-2010 in Vilnius, Lithuania. Anderson posted roughly 400 video clips and photos from the events of IGF-2010, including a video survey of delegates. 2011-12: The Imagining the Internet Center was named a Computerworld Honors Program Laureate for its use of information technology to promote positive social, economic and educational change. In 2011 Anderson produced and presented a 10-minute video on the future of the Internet at the Danish Top Executives Summit in Copenhagen; co-led a session on the future of the Internet at the South By Southwest Interactive conference in Austin, Texas, with Paul Jones of UNC-Chapel Hill; delivered a keynote at Webcom 10 in Montreal; and was a keynote speaker at MobilityShifts, a conference on the future of learning hosted by The New School in New York City. Cambria's book-length version of Anderson and Rainies' fourth expert-predictions survey, "The Future of the Internet IV: Challenges and Opportunities," was published in early 2011. A team of 26 people from Imagining the Internet recorded the events of the Internet Governance Forum-USA 2011, and a team of 23 people recorded all of the details of 16 2012 IGF-USA events. Both IGF-USA conferences took place in Washington, D.C. In the fall of 2011, a documentary video team including Baranowski, Nicole Chadwick, Kellye Coleman, Taylor Foshee and Lee Hopcraft, led by Elon associate professor Rich Landesberg, conducted a video survey at the Global Internet Governance Forum-2011 in Nairobi, Kenya. More than 400 video clips were assembled from the survey conducted in Kenya by this team. Eight significant Elon University/Pew Internet reports stemming from the fifth "Future of the Internet" survey conducted by Anderson and Rainie were published in 2012 by the Pew Research Center and the Imagining the Internet Center. The Internet Society provided generous funding support for Anderson to train and lead a team of 12 in conducting multimedia documentary coverage of the Global INET 2012 conference in Geneva, Switzerland, April 22-24, ISOC's 20th Anniversary Conference, which also featured the inaugural Internet Hall of Fame Ceremony. Elon alum Aaron Moger created a video telling the story of Imagining the Internet and its work. Imagining the Internet teams are seeking funding to support their documenting of major U.S. and international technology conferences in order to continue gathering people's views. Please contact Janna Anderson at andersj at elon dot edu if you want to know more. Janna Quitney Anderson is an associate professor and director the Imagining the Internet Center, based in Elon University's School of Communications. She has led several major studies for the Pew Internet Project, including the work leading to generation of all of the content on the Imagining the Internet site and an ethnographic study of the use of the Internet by small-town families (www.elon.edu/pew/oneweek). She is the author of the book "Imagining the Internet: Personalities, Predictions, Perspectives" (Rowman & Littlefield, August 2005) and the lead author of the "Future of the Internet" book series, published by Cambria Press (2008- ). Elon University is seeking financial support for the Imagining the Internet Center as it works to illuminate Internet evolution, providing student engagement and youth education in communications policy while also informing policy and futures thinking. Please contact Janna Anderson to learn more about providing support for this important work. This site was conceived and developed and is edited and maintained by Anderson with some database, video and Web page-design assistance from Dan Anderson, John David Parsons, David Morton, Brian Meyer and Christopher Eyl of the University Relations department at Elon. Elon faculty Constance Ledoux Book, Colin Donohue and Glenn Scott are senior fellows of the Imagining the Internet Center; each has taken vital leadership roles on several projects over the years. Administrative support for the Imagining the Internet Center is provided by Elon University President Leo Lambert, Executive Vice President Gerry Francis, Provost Steven House, Associate Provost Constance Ledoux Book, School of Communications Dean Paul Parsons, School of Communications associate dean Kenn Gaither, leaders of the Elon University Undergraduate Research Program and support-staff members Phyllis Phillips and Pam Baker. Other contributing faculty and staff from Elon include Aaron Moger, Michelle Ferrier, Harlen Makemson, Rich Landesberg, Vic Costello, Bryan Baker, Brad Berkner, Linda Lashendock, Brian Meyer and J McMerty. Elon alumni Jennifer Guarino, Olivia Hubert-Allen, Jennifer Connolly, Morgan Little, Ashley Barnas, Bethany Swanson, Lianna Catino, and Carolyn VanBrocklin have also played important roles along the way. 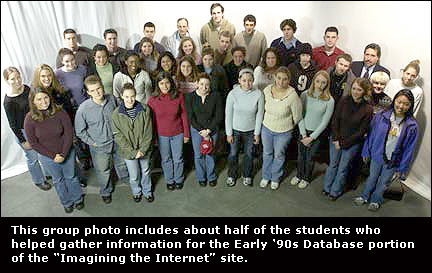 In the years since 2005, Elon undergraduate students who have provided valuable assistance with Imagining the Internet Center projects and/or helped produce elements for the site or the “Future” reports one or more times include: Erin Barnett, Scott Myrick, Janus Rogerson, Michele Hammerbacher, Anne Nicholson, Dannika Lewis, Eryn Gradwell, Tyler West, Ashley Barnas, Craig Campbell, Alexa Milan, Randy Gyllenhaal, Morgan Little, Josh Chagani, Alex Trice, Eugene Daniel, Drew Smith, Andie Diemer, Lindsay Fendt, Shelley Russell, Tyler Anderson, Kirsten Bennett, Lianna Catino, Rachel Cieri, Ashley Dischinger, Christina Edwards, Shea Northcut, Dan Rickershauser, Katie Roberts, Laura Smith, Ryan Sweeney, Carolyn VanBrocklin, Kassondra Cloos, Jack Dodson, Nick Ochsner, Laura Ward, Sam Bianchetti, Jasmine Spencer, Mallory Lane, Andrew Creech, Corey Groom, Anna Johnson, Melissa Kansky, Camille DeMere, Sam Calvert, Rebecca Smith, Bonnie Efird, Sam Baranowski, Bethany Swanson, Ronda Ataalla, Kellye Coleman, Steven Ebert, Natalie Allison, Jeff Stern, Nicole Chadwick, Jeff Ackermann, Joe Bruno, Jeff Flitter, Elizabeth Kantlehner, Derek Scully, Rachel Southmayd, Katy Steele, Julie Morse, Kristen Case, Addie Haney, Caitlin O'Donnell, Brandon Marshall, Jacquie Adams, Katie Blunt, Mary Kate Brogan, Allison D'Amora, Keeley Franklin, Janae Frazier, Ryan Greene, Audrey Horwitz, Perri Kritz, Madison Margeson, Katie Maraghy, Brennan McGovern and Brian Mezerski. Elon Interactive Media Master's students making contributions include Maria Rojas, Melissa Spencer, Brook Corwin and Cathy Freeman. If you like what we are doing, please consider making a gift to Elon University that is earmarked for general support of the projects of the Imagining the Internet Center. The Center takes a neutral, objective approach to its work and does not do sponsored research. However, we are seeking general gifts to underwrite the overall operation of the center, provide support for documentary projects and extend the influence of Imagining the Internet to add to the global dissemination and impact of its reports. The center not only provides a public service in documenting the evolution of the Internet, it also serves as a wonderful experiential-learning setting for the young people who assist in the compilation of the data you see on the thousands of Web pages of Imagining the Internet. It is teaching young leaders to understand the complexities of the issues that lie ahead for all of us. Most of the Center's meager funding at this point is provided by Elon University's School of Communications. The Pew Internet & American Life Project, a non-profit initiative of the Pew Research Center, got Imagining the Internet started with a foundational grant that built the Early '90s Predictions Database, and Pew Internet continues to partner with the Center on the "Future of the Internet" surveys and some of the Center's books. Elon University is ranked #2 among Southern universities by U.S. News & World Report and is named among the nation's best colleges and universities by Princeton Review and Newsweek-Kaplan. With an enrollment of about 6,000 students, Elon offers more than 60 majors in Elon College, the College of Arts and Sciences, and in the schools of communications, business, law and education. Elon is recognized by the National Survey of Student Engagement as one of the most effective universities in the nation in actively engaging students in learning. Forbes and Intel Corp. have named Elon University among the top colleges and universities in the nation for wireless computing access. As a national model of engaged learning, Elon seamlessly blends academic and co-curricular activities, especially in flagship programs known as the Elon Experiences (including volunteer service projects, internships, leadership positions, formal undergraduate research and study abroad). Why is it Vital to Study the Future?